In Part I of this series I discussed my fondness for the Windows Phone platform and being all but forced to move on from it. In Part II I discussed my spin with the Apple iPhone 6s, and how I wasn’t quite satisfied with that. My dissatisfaction led to picking up a cheap ($5) prepaid Android phone running KitKat on Amazon to use as a toy really. I wanted to experience Android OS more hands on than I had in the past. I knew this wouldn’t be an iPhone replacement, the specs were atrocious on this phone from LG, but it could give me an idea of what to expect from Android. Immediately I appreciated the ability to set default apps (Outlook, FireFox, Google Photos, Messenger) as well as the openness of the Android platform. Android can be customized in about every imaginable way, it has supports for widgets, icons, folders, much more than just the huge grid of static icons that IOS has offered since version 1.0. I began to seriously question my Apple fling. Enough so that I purchased a used Nexus 5 on Ebay for $35 which would allow me to run the latest version of Android at the time: Marshmallow. I wanted to make sure that I knew what I was getting into with the Google Ecosystem. As many of you who know me personally, I don’t trust Google completely. This was gonna be a hard pill to swallow to give Google more access to my personal information. I trust Microsoft & Apple more with information than I do Google. So much so that I have a Gmail account but I never use it, preferring my Hotmail.com account instead. However, I was willing to look past some of that to see if the grass was greener on the other side of the fence. I’d been keeping a close eye on the Galaxy S7 when it launched and had even gone into T-Mobile to take a look at it in action. There were so many features that I really liked about it- a water resistant body, expandable storage, a better aperture on the camera, and better display. In Summer of 2016 I finally took the plunge and headed to my local T-Mobile store. Since I have the JUMP program at T-mobile I was able to do an exchange for my iPhone 6s to the Samsung Galaxy S7 without having to pay a down payment. I was essentially out $99, however, from the money I put down on the iPhone to take it to the 64GB option. I went right to work, installing all my favorite apps, exploring the Samsung stock software, and setting up my phone how I wanted it to be in ways that I couldn’t with iOS. I was able to set my program defaults and even disable some of the Samsung bloat that I would never use. I installed and uninstalled several different Launcher apps (essentially the GUI that handles and displays all of your applications), played with several SMS applications, as well as keyboard applications. Finally I settled on a hybrid approach that uses part Google (SMS), part Samsung (lock screen), and part Microsoft (Launcher). I also setup Google’s Assistant, and began playing with that. I have found that she is a lot easier to talk to than Siri (maybe it is our mutual interests? ), with less shouting matches between us. The assistant can be invoked above any window and can even offer you insights into the window you are on. There is more of a natural spoken language, both as an input and as what the assistant outputs. Not only that but you give the assistant the searching power that Google is known for and you end up with a pretty powerful ally. All that being said, I am still more of a Cortana guy- she’s more my type. Unlike the iPhone you can actually setup Cortana to be your virtual assistant instead of OK Google — however I have noticed that Microsoft still has some work to do in making that work seamlessly. The camera on the S7 works way better in lower light than the iPhone, having a different fixed aperture will do that. As for a quality standpoint I would say Apple and Samsung are on par with each other– I haven’t been blown away by the S7’s lens when compared to the iPhone except in low-light conditions where I don’t need a flash or don’t want one. Samsung also includes different camera modes and at the time I purchased the phone it could shoot RAW + JPG while the iPhone couldn’t. In iOS 10 Apple enabled that functionality though most people probably aren’t concerned with this. One more HUGE advantage that Samsung has in the S7 over the S6 or any iPhone ever made is that it supports expandable storage. I have a 128GB SD card in there right now which allows me to take all kinds of photos, and HD video without worrying about space. All of my stuff is synced to the cloud but since purchasing this phone I have yet to worry about deleting ANYTHING on the phone. That includes my Amazon Music purchases which sync automatically to my phone and are stored on the SD Card. While Samsung could have implemented this a little better for other storage needs, it works beautifully for storing photos and music. 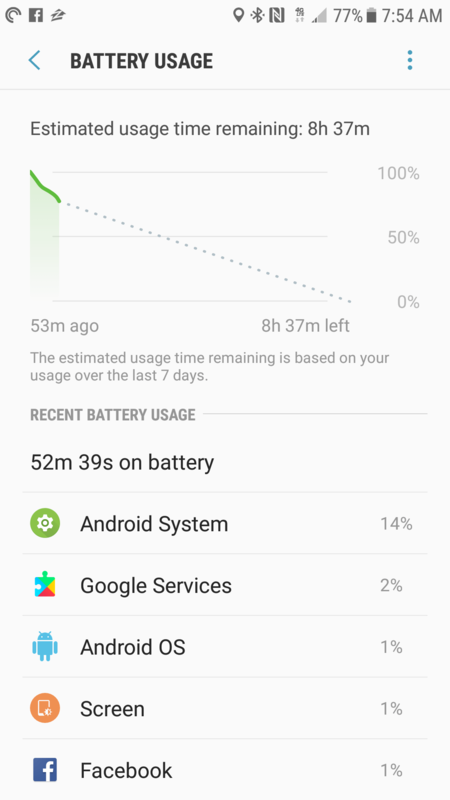 Battery Life in Nougat Beta – Whats with the Android System Usage? the battery in the S7 beats that of the iPhone 6s/7 as well as the previous generation S6. Yes the S7 also has a more powerful screen than its iPhone counterpart, which uses more battery — but not enough to make the differences I have seen. I believe this comes down to App Management. Apple does a pretty good job of making sure things aren’t running amok in the background, snoozing apps, background OS tasks, etc. Part of that is due to the closed nature of the iOS infrastructure – you just can’t put as many tentacles into the underlying system — but a large part is Apple understanding the total picture of battery, hardware, and OS. Android is working on making that better — with Nougat they added more battery optimizations and made their doze functionality smarter/more aggressive. As of this writing Nougat is not yet out for the S7, and in my early beta testing of it I have seen some improvement in that department but not where I’d like it to be. I will sometimes go to work and be down from 100% battery to 80% using only the bluetooth and the Audible App while in the car. When I investigate it will be a rogue app that has killed my battery such as a weather one or even the Android system itself. A large part of that blame lies on Samsung and their incessant need to create extra apps that are baked into the phone itself. Again I am hoping this gets addressed with their slated official release of Nougat in January 2017. Even with my complaints of battery life, the Samsung S7 is my preferred “system” at this point. It is the most flexible, and most PC like experience you can get on a mobile device (save for the niche market of Windows 10 Mobile). Yes I miss out on features that my family members use such as iMessage and FaceTime, but I can customize the crap out of this phone. Also I really put the water-resistant features to the test being out here in the Great Pacific Northwest. I was able to text in the middle of a rainstorm while attending a football game without concern for the phone. I do think Apple has the perfect advantage since they control the phone from hardware to firmware to software so they have less issues with battery life, and weird system performance issues. Google is catching up with their own line of phones, but they are catching up which is something Google doesn’t do often. Looking ahead I am curious what the Galaxy S8 will bring in the spring and the Iphone 8 in the fall. When Samsung releases the official final build of Nougat for the S7 I am hoping it will solve some of my software-based issues as well as the battery life. I look forward to testing that later this month. While I left Windows Phone, I still follow what Microsoft and its partners are up to– including, but not limited to the Surface Phone rumors. I couldn’t go back, not with the non-existent app ecosystem I left behind. All the apps I use on my phone can be used on either iOS or Android and with the services I use I am not married to either. 2017 could be time for another switch but for now I am happy with the S7. I have been flirting with the idea of other phones beyond my iPhone after all these years, but have yet to actually leave. I do miss the PC-like environment at times. My current iPhone 5s I’ve had for now 2.5 years, it’s eventually going to turn into a flip phone. The fact that battery life is still pretty good seems pretty crazy.